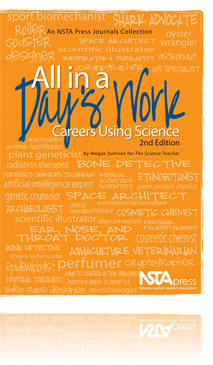 All in a Day’s Work, 2nd edition is a compendium of 49 of the popular “Career of the Month” columns from the NSTA high school journal The Science Teacher. Each column profiles a person in a science-related job and can be reproduced and shared with your high school students as they make career and education plans. Each profile includes suggestions about how to find additional career information, including links to websites and relevant professional organizations and interest groups.